A weekend at home seems like a real blessing by now. I haven’t been home in 8 months! That’s the longest I haven’t been home in like forever! I had volcanoes stopping me, snow storms holding me back, and this time I was praying the tube wouldn’t break down/be stuck/be held by various signalling problems. And it didn’t! I managed to get to the airport 40 minutes before departure (phew, 10 minutes later and I would have had to significantly bribe the check-in desk) and embarked on a flight to lovely Luxembourg. Home. Home, sweet home. I could write pages about it, but I won’t. Not just yet. Three days in Luxembourg are way too short to even think about taking photos for this blog. One day, sooner or later, I will write a whole post about my small country, so patience please. 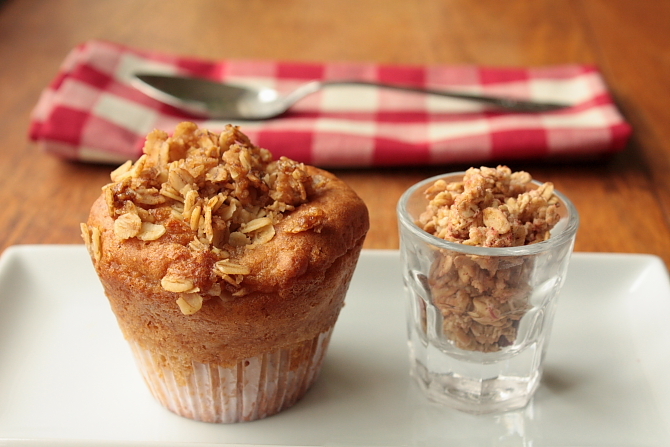 For now, let’s turn to these lovely breakfast muffins! It’s summer and peaches are everywhere. Don’t you just like to just bite into a crisp cold peach?! It’s heaven. Or quickly cook them with a dash of wine and cinnamon, then scoop over some creamy vanilla ice cream? Yuuuum. Or bake them with some crumble on top? Yes! Name anything and I like it! 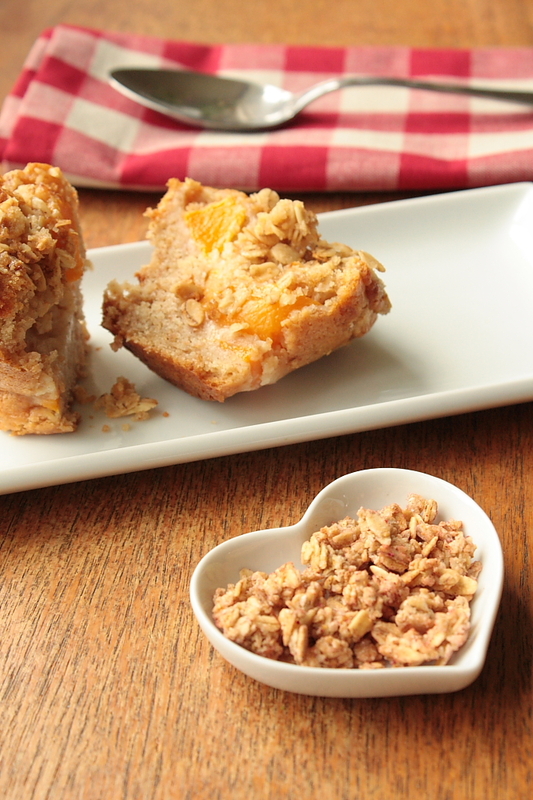 Prepare the crumble topping: melt the butter and mix it with the sugar and oat flakes. Put into an oven proof dish and bake for about 15 minutes or until the mix caramelizes. Remove from the oven and set aside until later. Meanwhile prepare the cake batter: in a bowl combine the softened butter with the sugar until creamy. Add the egg, yoghurt and vanilla essence and mix until smooth. Mix the flour with the baking powder, cinnamon and salt. Gradually add to the egg mix and beat until creamy. Cut the peaches into chunks and carefully incorporate them to the batter. Put cupcake papers into a cupcake mould and distribute the batter between them. Bake for 5 minutes. PLEASE NOTE: These muffins don’t rise much in the oven, so make sure to fill your muffin tins to the top. Mine look so big since I used deep muffin tins, the size of two ordinary cupcakes. Love your muffins and pictures. They look drooling good. Oh man, you’re in Singapore at the moment?! I am planning on visiting your hometown at the beginning of next year, so hook me up with some great foodie tips! Enjoy your stay! Oh those do look good. I actually haven’t had any peaches yet this summer – I’ve been too into berries. But you’ve inspired me. I think I will have to double or even triple the recipe though, to keep my hungry family happy! Hey Anne, Must be nice to be home after your travels! Those look stunning & I imagine would go beautifully with good coffee! I plan on making them at the weekend, but wondered what sort of Oat Flakes you used? Thanks..
Ah Rachel, any pastry goes well with good coffee, doesn’t it?! In terns of oats, I just used some rolled oats from Wholefoods, since you cam choose as much (or little) as you want.They’re bigger than your average porridge flakes, but I don’t know what they were called. By the way, how did the move go? oh sweet anne! i’ve missed you so! here i am and see you were in luxembourg a place i also want to visit! we could plan a short trip together! 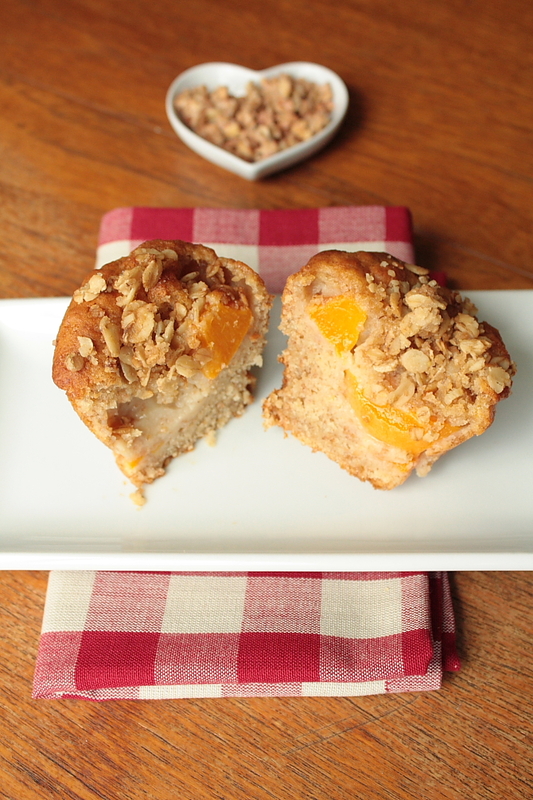 love these muffins peaches and cinnamon = pure love! Lovely muffin pictures, I am dying to make some more of these with my little boy soon. Ha, how interesting! I am indeed planning on going to Singapore and Malaysia at the beginning of next year, so you’ll have to give me some tip! It’s so good to be home indeed!! 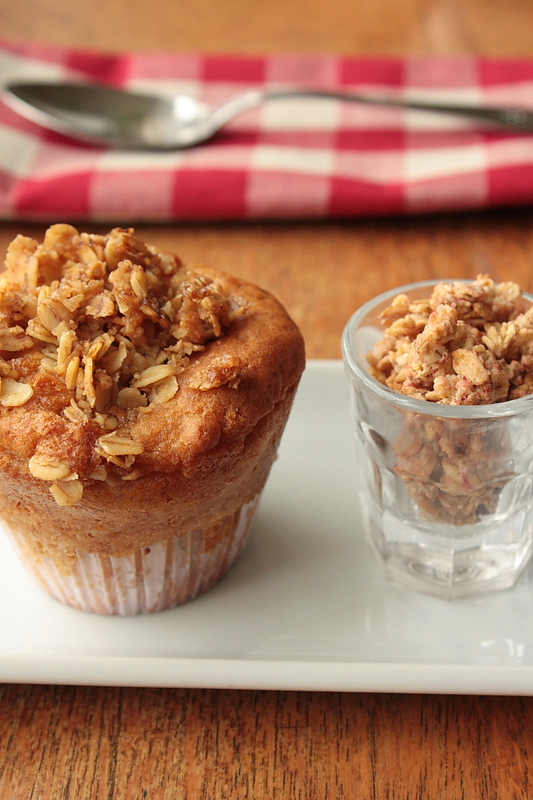 Those muffins are absolutely addictive… Love the crunchy top!!! Just found your blog and its gorgeous and full of all my favourite things. Will be back to read more! you know i am ready for that post on luxembourg – i can’t wait !! 🙂 but ok, ok, i’ll be patient !! i’m so glad to hear you were able to go home, i am sure it was a blast – and that your family was beyond thrilled. yum to these muffins too, mmmmm. These look delicious! I love peaches so I’ll have to try these for sure. Oh Anne, I love this recipe. 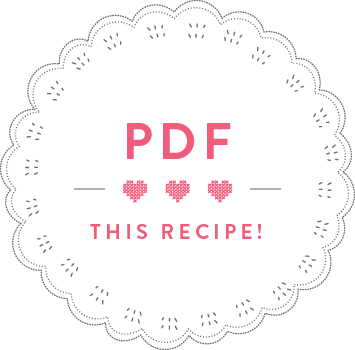 it is becoming a tad repetitive to come here and say that but your recipes talk to me. This crumble with oats is a favourite and I will ‘borrow’ the idea and apply to a few things that i do every so often. I would love to hear about your country. One day you said..will hold you to it. 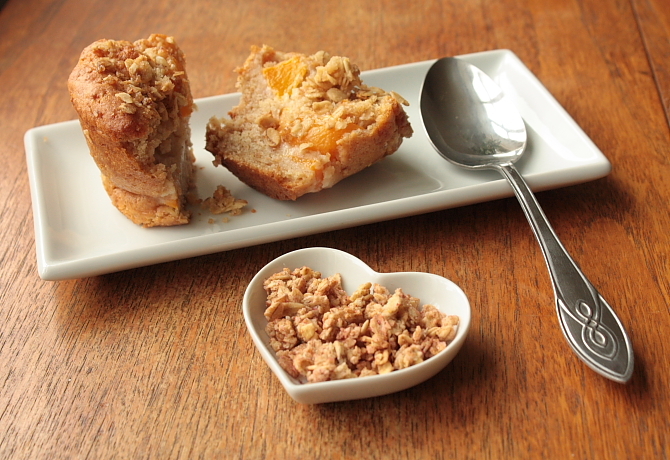 I absolutely loved this muffing recipe with yogurt. It looks delicious. Ooo! These look delicious! I will have to convert to American measurements and make pronto!